Something life changing has happened – we got a juicer! The Hamilton Beach Big Mouth Juice Extractor, to be exact. 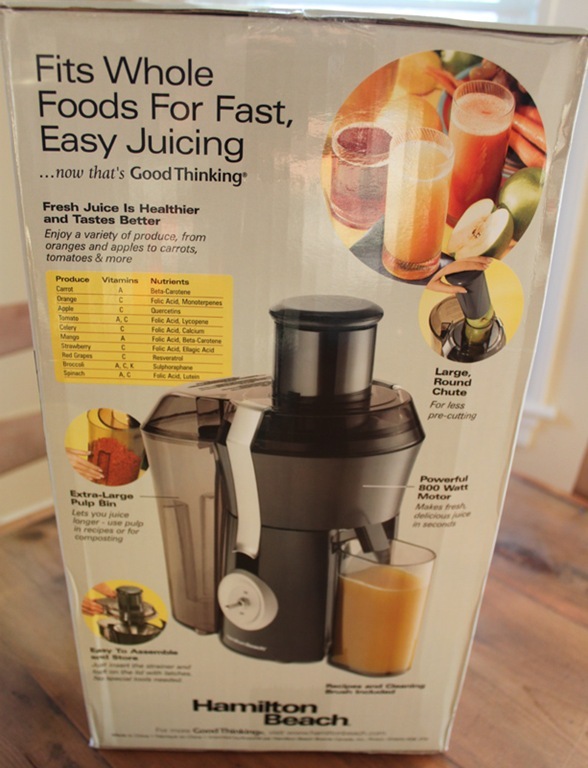 I’ve been seriously considering buying a juicer since I watched Fat, Sick, and Nearly Dead over the summer. We had a few Amazon gift cards from Christmas and nothing else that we really needed (other than a new pizza stone, which I also bought) so it was time to buy a juicer! I’m writing this review after having used the juicer for one full week so I could give you all the details. Everything you need to start juicing comes with the HB Big Mouth Juicer – juicer base, pulp container, juice cup, plunger, cleaning brush, and manual. 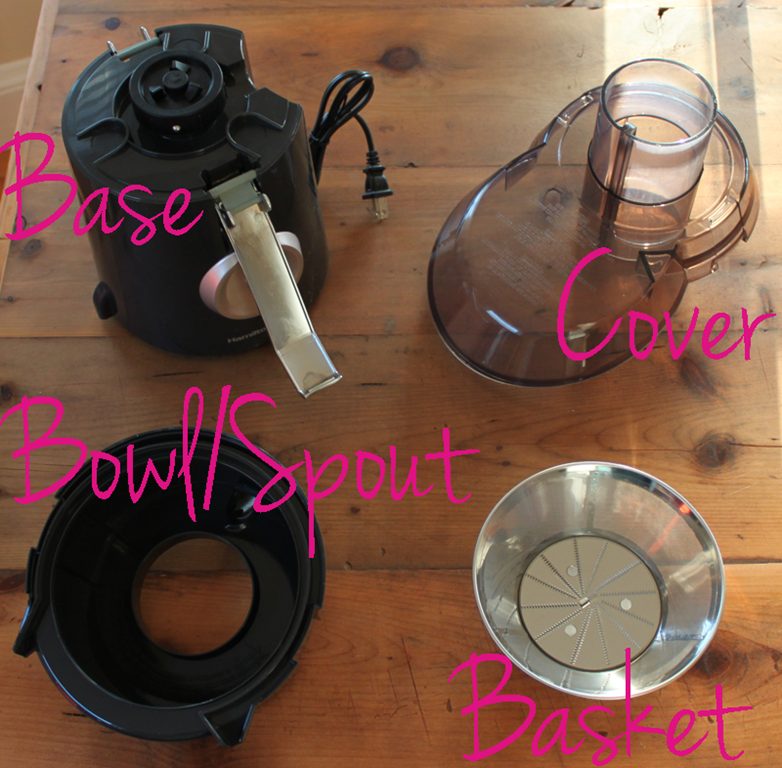 The specific parts to the juicer that actually juice the fruits and veggies are the base, cover, bowl, and basket. The HB Big Mouth Juicer is a centrifugal juicer which means that the juicer cuts up the fruits and veggies with a flat cutting blade, then spins the produce at a high speed to separate the juice from the pulp. There are many other kinds of juicers (reamers, masticating juicers, and triturating juicers) but I’m not going to get into those. With the HB Big Mouth Juicer you feed the fruits/veggies through the circular opening in the cover and push down with the plunger into the basket. The pulp shoots over into the pulp container and the juice centrifuges around the bowl and pours down through the spout into the juice cup. The manual is brief but that’s ok, the machine is very easy to use. 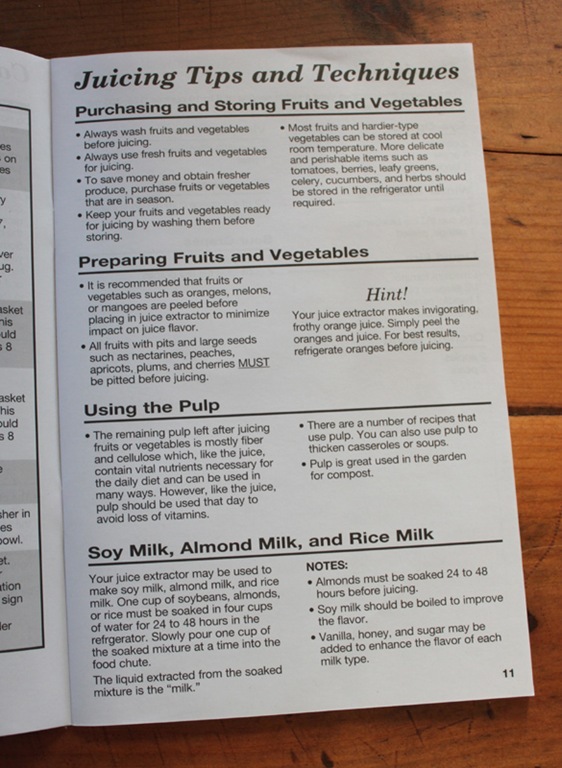 The manual also provides a page on juicing tips and techniques which I found to be super helpful. It also gave some ideas about what to do with the leftover pulp and how to make almond/soy/rice milk! Nice! All of the HB Big Mouth Juicer parts are dishwasher safe (minus the base, of course) which is a big plus. However, I find that handwashing each part takes no more than 3 minutes and is very easy. The cleaning brush that is included with the juicer is extremely helpful for cleaning the basket/blade. I just use a regular sponge with hot, soapy water for the rest. It took me about 2-3 tries with this juicer to feel fully confident using it. There is just one on/off switch on the base which is straightforward but it took me a few tries to get the rhythm of feeding the produce and plunging it without produce shrapnel spraying out through the top of the cover or bouncing around too much on the blade. It also took me a few tries to get the pulp container to sit just right – the first few times I used it I had some leakage at the top corners but that was quickly resolved by just getting a tighter fit under the cover. One helpful thing the manual suggests is to line the pulp container with a plastic bag for easy clean up. I started doing that mid-week and it really worked! I didn’t have to wash, or even rinse, the pulp container when lining it with a plastic bag. The noise from the motor is a bit loud. I’ve been juicing at 6:30AM most mornings so I may also be hyperaware of the noise level I’m making that early, but I do wish it was a little quieter. 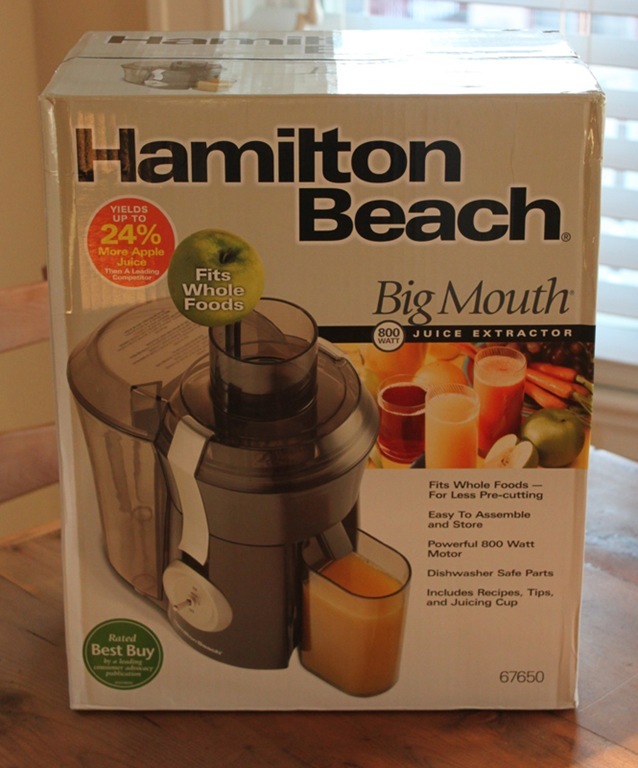 The HB Big Mouth Juicer is billed as “Big Mouth” because you can allegedly fit whole fruits into it. The box shows a whole apple but I had to cut the apples I used up into quarters before they fit into the opening. I’d say the size of the food chute, realistically, is better for something kiwi-sized to stay whole. I love that there are no filters or accessories that you need to buy to work the juicer. Fancier centrifugal juicers use filters but I think that’s a hassle. 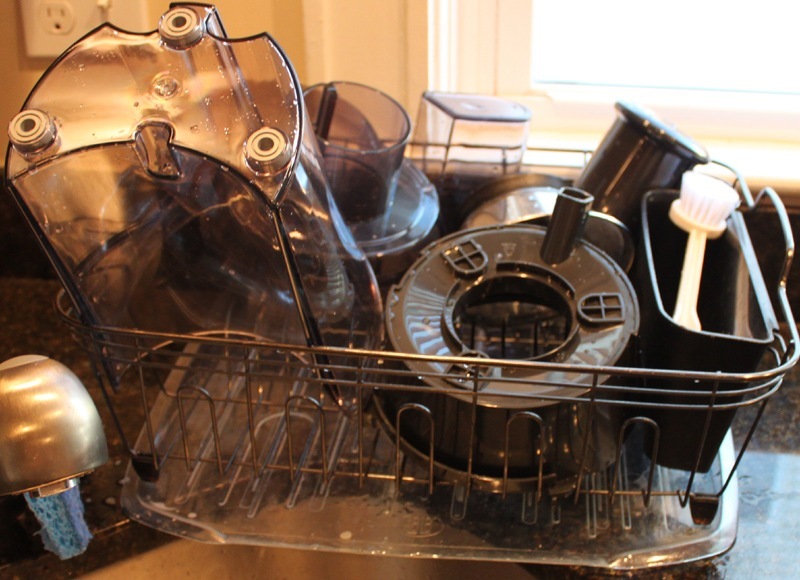 Clean Up: As I mentioned before, clean up is a breeze whether you handwash or use a dishwasher. I also prefer to handwash because I’ve been using the juicer every morning and don’t run the dishwasher every day. Handwashing the basket/blade is gentler and I can make sure I’ve gotten every little bit of pulp removed. Bottom line – a simple rinse will get every piece of this juicer spotless, the basket/blade requires a scrub though. Juicing Outcome: It takes a lot of produce to create one cup of juice. The volume of juice really depends on how water-based the produce is. For example, I found that apples, lemons, and cucumbers yielded larger volumes of liquid than kale or ginger. That said, adding ice or water are perfectly fine for me to stretch the juice to fill a 12 oz. mason jar. Overall Thoughts: I’m in love with this juicer. I think in just one week of juicing every day I’ve already gotten my money’s worth. 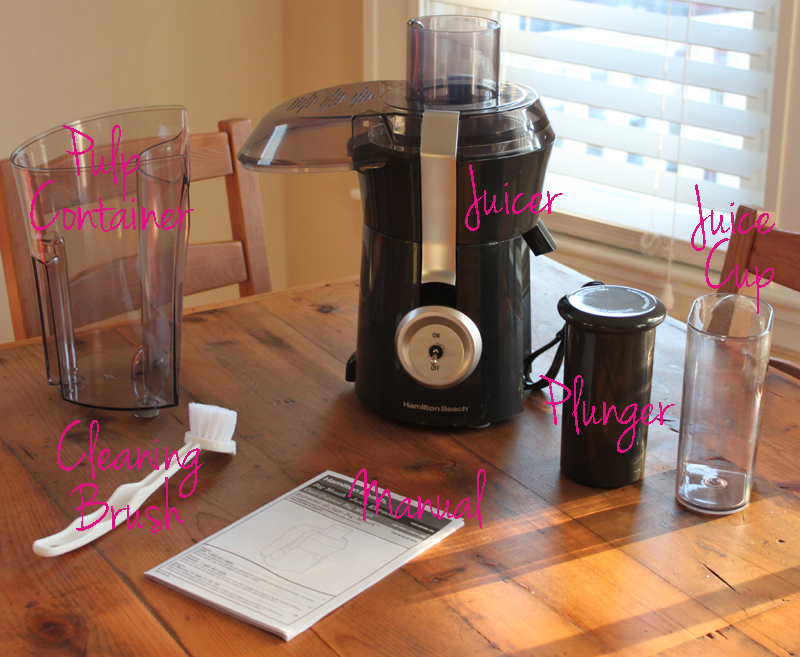 You really can’t beat $60 for a juicer that is this easy to use and clean up. It is a small investment in something that will impact our health in a huge way. That alone is totally worth it. Just bought this juicer. Psyched!!!! Super duper awesome!!!!! Let me know when you get it?